Family Danz Heating & Cooling is a trusted name in home comfort. 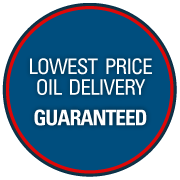 But did you know that we also provide our Capital District customers with an oil delivery price guarantee as well? We sell only premium grade fuel oil at the lowest possible price – guaranteed. We post our current price right on our website, and we will meet any price you may find that is lower. When you choose Family Danz to meet your fuel oil needs, Capital District residents can schedule automatic delivery at no additional charge. Discounted budget and prepayment plans are available with automatic deliveries. Or, if you prefer to call when you need a fuel oil delivery, we recommend that you kindly contact our office when your tank gauge is between half and a quarter full, in order to allow ample time for scheduling delivery. Don’t be left out in the cold this winter – choose a trustworthy, reliable fuel oil delivery company conveniently located in the Capital District – Family Danz Heating & Cooling. Call us today at (518) 427-8685, or fill out our online form to schedule your next fuel oil delivery and to ask about our convenient payment options.Family Danz Heating & Cooling is a full-service fuel oil delivery provider. The oil delivery price guarantee for Family Danz is available in Albany, Schenectady, Saratoga, and surrounding areas.